In Late Antiquity the emergence of Christian asceticism challenged the traditional Greco-Roman views and practices of family life. The resulting discussions on the right way to live a good Christian life provide us with a variety of information on both ideological statements and living experiences of late Roman childhood. This is the first book to scrutinise the interplay between family, children and asceticism in the rise of Christianity. Drawing on texts of Christian authors of the late fourth and early fifth centuries the volume approaches the study of family dynamics and childhood from both ideological and social historical perspectives. It examines the place of children in the family in Christian ideology and explores how families in the late Roman world adapted these ideals in practice. Offering fresh viewpoints to current scholarship Ville Vuolanto demonstrates that there were many continuities in Roman ways of thinking about children and, despite the rise of Christianity, the old traditions remained deeply embedded in the culture. Moreover, the discussions about family and children are shown to have been intimately linked to worries about the continuity of family lineage and of the self, and to the changing understanding of what constituted a meaningful life. "Ville Vuolanto has already made a name for himself as one of the foremost scholars working on the family in Late Antiquity. In his new book, he brings his formidable knowledge of early Christianity and current sociological, historical, and theological methodologies to offer an innovative and sophisticated approach to the study of "strategies of continuity" among the newly Christianized elites of the late Roman Empire. It is a fascinating study of the way elite Christians confronted and ultimately reconciled the competing ideologies of ascetic Christianity and traditional ideas of familial pietas and continuity." "Rigorous and rewarding, [this] book is an important contribution to the social history of the late imperial period and to modern discussions of the nature of the Roman family in that age." 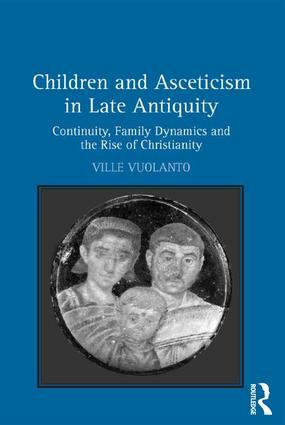 "This has been an eagerly awaited book, the author's previous work having already done much to renew approaches to late Roman childhood, especially within the family context… What Vuolanto demonstrates quite convincingly in this book is how the ideological framing of asceticism in that period is what facilitated the transition from Roman to medieval family, by anchoring a very un-Roman practice into traditional Roman discourse about the family." "Vuolanto’s study looks at the interaction between familial strategies and the growth of asceticism in Late Antiquity, using a wide range of literary sources and approaches from the study of family history. The result is an innovative book that certainly brings something new to the history of asceticism." "VV’s two part study of ideology and of its application keep in sight throughout the twin questions of continuity versus asceticism precisely by highlighting their malleability. His careful analysis of the relevant primary sources serves to support the arguments. Indeed, this study is a model of clarity, comprehensiveness and organization." Ville Vuolanto is Research Fellow at the University of Oslo, Norway and Adjunct Professor of History at the University of Tampere, Finland. He has published a number of articles and book chapters on the history of family and childhood in Roman, late antique and early medieval contexts. He also maintains an extensive online bibliography Children in the Ancient World and the Early Middle Ages.